Monday’s UTT article entitled “The Path to Victory Begins with Knowing the Threat” made one important point: the threat America faces from the Global Islamic Movement has EVERYTHING to do with Islam. One more time: it is a capital crime in Islam (sharia) for a muslim to teach another muslim anything about Islam that is incorrect AND it is obligatory for a muslim to lie to non-muslims when the goal is obligatory – like advancing Islam. Which means to understand Islam, a person must study the authoritative books of sharia muslims teach each other when non-muslims are not around. That is what UTT does. Therefore, it is unprofessional for U.S. political leaders, intelligence professionals, pastors, and our military leaders to use “Islamic scholars/experts or Imams” to tell them about Islam. Yet, for years America’s leaders have used Al Qaeda operatives like Abdurahman Alamoudi and IMAM Anwar al Awlaki or Muslim Brotherhood/Hamas operatives like Nihad Awad, IMAM Mohamed Magid, Sayeed Syed, Muzammil Siddiqi, Salam al Marayati, and others to tell them about Islam. This is one of the main reasons our leaders lack an understanding of the true nature of the threats we face. Two glaring examples reared their heads this week just in time for this article to be published. First, Dr. Qanta Ahmed is a jihadist in a pant-suit who is an expert in verbal oragami. In UTT’s recent videos, Qanta Ahmed discusses the difference between “Islamism” – the violent ideology according to her – and “Islam” – the peaceful religion that has nothing to do with Islamism. In military-speak we call this an “Information Operation.” For the layman, its called a LIE with the purpose of keeping you from understanding the threat until its too late. See the UTT videos HERE and HERE. As always, the media is a willing accomplice. 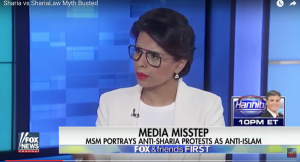 This week Qanta Ahmed has now separated “sharia” from “sharia law.” In this incredibly obvious propaganda effort, Fox News swallows and regurgitates this nonsense. See UTT’s video HERE. UTT continues to encourage all readers to know, digest, and understand that there is no “version” of Islam which does not mandate war against non-muslims (jihad) until the entire world is under Islamic rule. All of this is a crafted campaign meant to buy time and keep people from focusing on the threat we face – Islam. Write, call, tweet your Washington congress people, tell them to support H.R. 377 designating the Muslim Brotherhood as a terrorist organization.